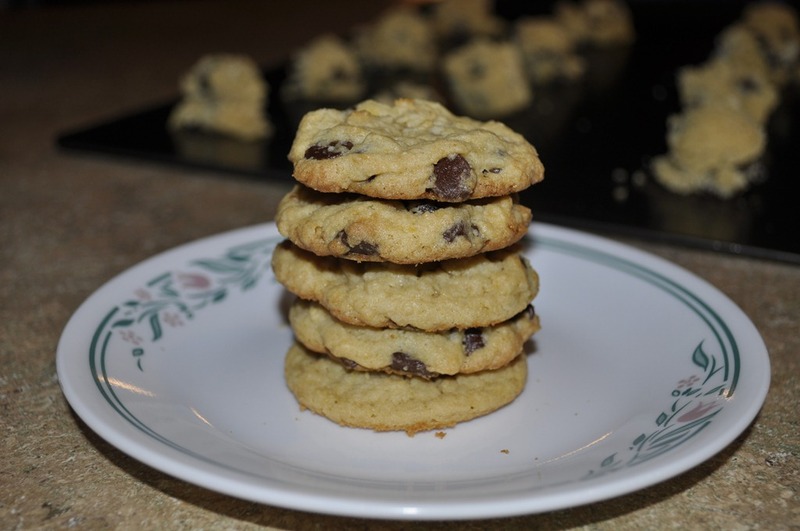 I have always enjoyed making cookies and have many favorite cookie recipes, however I have never managed to find a Chocolate Chip Cookie recipe that I am in love with. I have tried many different chocolate chip cookie recipes and they never seem to taste as good as my favorite store bought cookies. I was checking out Two Peas and Their Pod one day and I saw their posting for Vanilla Pudding Chocolate Chip Cookies I couldn’t believe that I had never tried a recipe like this. The Vanilla Pudding mix into the cookie batter seemed so obvious and yet I had never tried it. The cookies were amazing! They had great flavor and were exactly what I was looking for. I think my husband and I ate at least a dozen right out of the oven. This will defiantly be a favorite in our house from now on! Beat together the wet ingredients in a bowl. 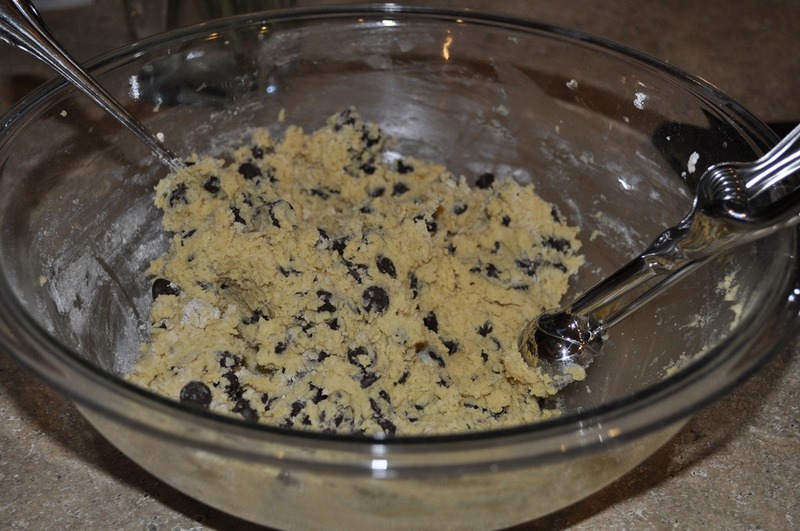 Once they are mixed together add the pudding mix, flour, salt, and baking soda and mix until combined. Then sir in the Chocolate chips. 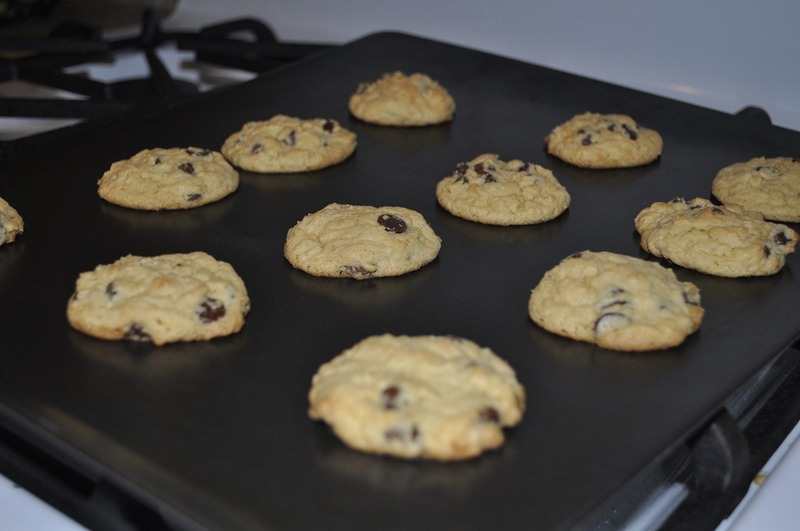 Drop rounded tablespoons onto a prepared baking sheet and bake at 350o F for 10 to 12 minutes. Let cool on baking sheet for 2 minutes and then transfer to cooling racks to cool completely. 2. In a large bowl beat together butter and sugars until creamy. Add in pudding mix, eggs and vanilla extract and mix until combined. In a medium bowl, whisk together the flour, baking soda, and salt. Add the dry ingredients to the wet ingredients and mix until combined. Stir in the chocolate chips. 3. 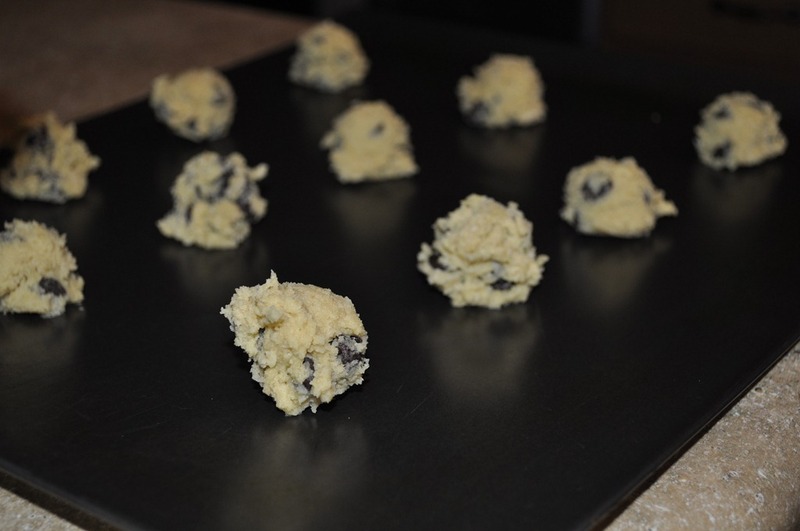 Drop rounded tablespoons of cookie dough onto a prepared baking sheet. Bake for 10 to 12 minutes or until slightly golden. Remove cookies from oven and let cool on baking sheet for 2 minutes then transfer to a cooling rack and cool completely. In one of our Mexican Packs from Bountiful Baskets we got Tomatillos. My husband and I had never cooked with them and really didn’t know much about them so we went on the hunt to find a recipe to use them in. 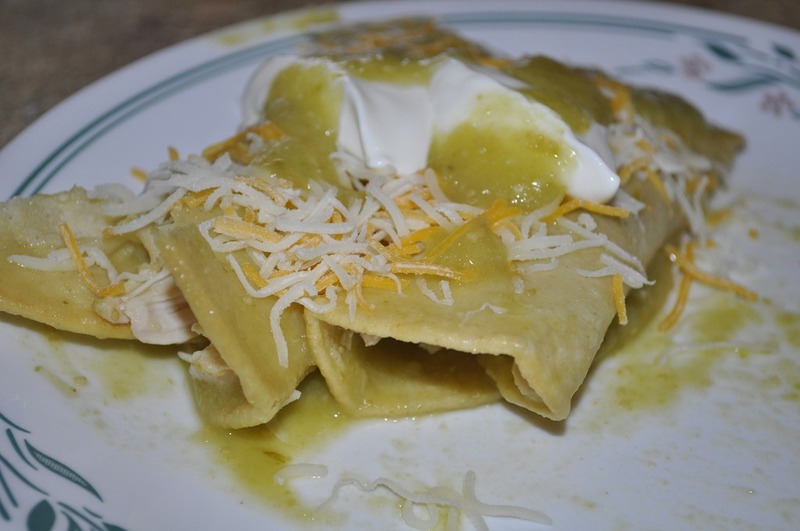 Enchiladas Verdes is what we found and it has been a huge hit ever since. 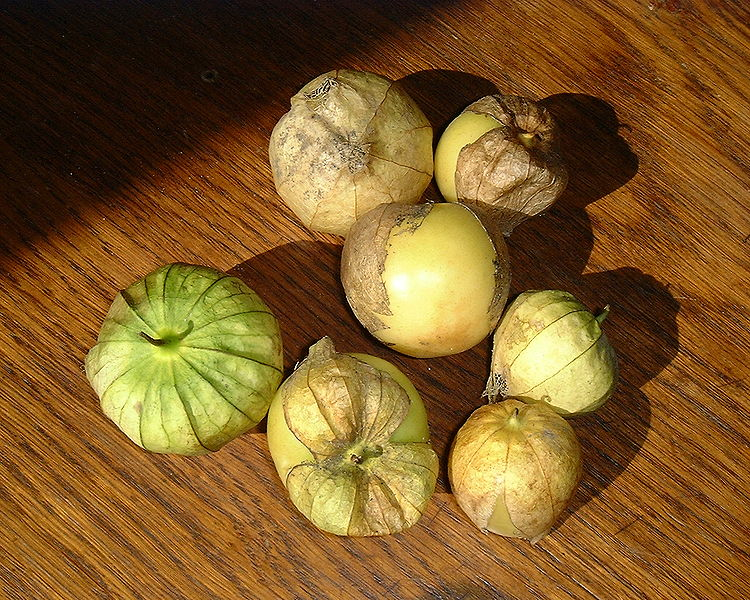 Now for those of you that don’t know what a Tomatillo is it is similar to a tomato but has a paper-like husk around the outside of it. When they are ripe they can be any number of colors but for most cooking you want a firm green Tomatillo. In Utah a lot of places would serve a Tomatillo salad dressing that was very similar to a ranch and I have also seen people use their Tomatillos to make salsa as well. For us it was a Verde sauce to go with our chicken enchiladas. This recipe is pretty simple, you just boil your chicken and Tomatillos and when they are done you shred the chicken and puree the Tomatillos. That is the simple version but you get a great dish with lots of flavor and heat depending on how spicy you like things. 1. In a saucepan combine chicken breast with chicken broth, one quarter onion, a clove of garlic, and 2 tsp. salt. Bring to a boil and then boil for 20 minutes. Reserve broth, set chicken aside to cool, and discard onion and garlic. When cool enough to handle, shred chicken with your hands. 2. Place tomatillos and Serrano chilies in a pot with water, enough to cover them. Bring to a boil and continue boiling until tomatillos turn a different shade of green (from bright green to a dull army green). Strain tomatillos and chilies, and place in a blender with another quarter piece of onion, 1 clove garlic, and a pinch of salt. 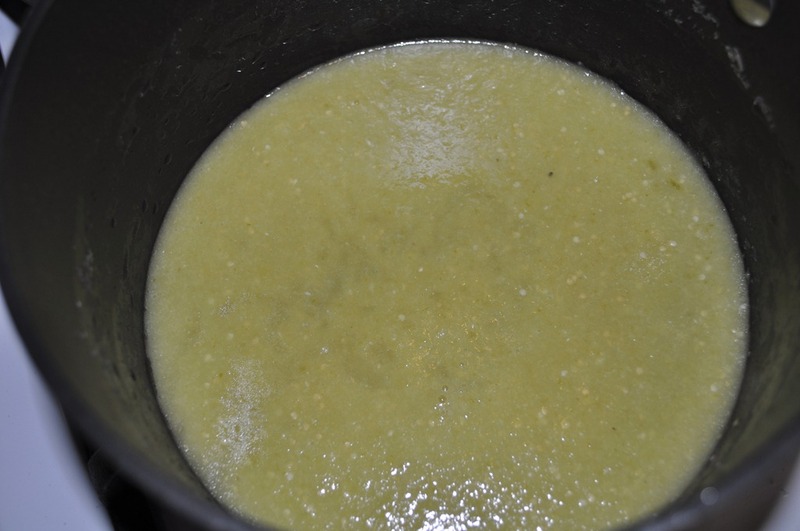 Pour in reserved chicken broth so that the liquid just covers the veggies in the blender by about an inch. Blend all ingredients until they are completely pureed. Pour salsa in a medium saucepan and bring to a low boil. 3. Pour oil in a frying pan and allow it to get very hot. 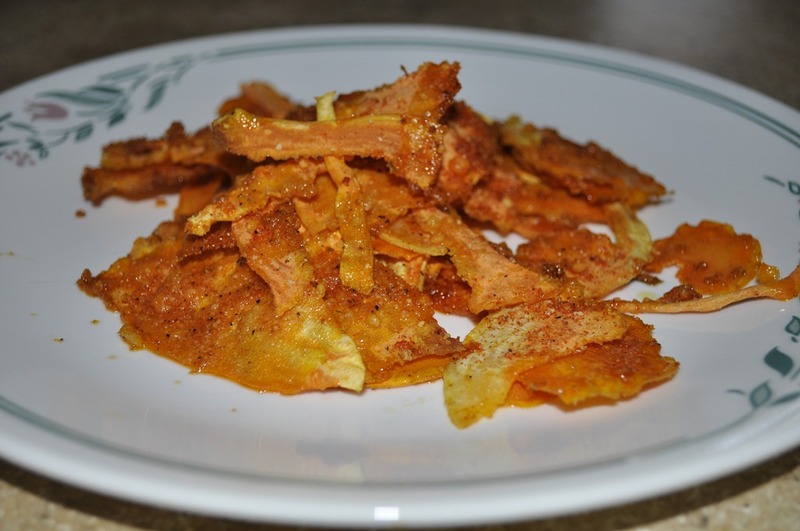 Slightly fry tortillas one by one in oil setting each one on a paper towel afterwords to soak some of the oil up. Finally dip each tortilla in low-boiling green salsa until tortillas become soft again. Place on plates. 4. Fill or top each tortilla with shredded chicken and extra green sauce. Top with cheese, onion, cilantro, or sour cream. * To make this dish hot keep the seeds in your Serrano peppers. To make this dish with less heat remove the seeds and membrane from your Serrano peppers and only add as many Serrano peppers as you wish. What was in the baskets this week? A great basket again this week. We had a late truck but all the participants were excited to help us out and we got everything unloaded and sorted really fast. In this weeks basket we got 3 zucchini, 2 mango’s, 5 apples, 1 bunch of vine ripe tomatoes, 6 yams, 1 bunch of asparagus, 1 bunch of spinach, 1 bunch of lettuce, 1 cantaloupe, 2 grapefruits, 7 bananas, and 1 bag of carrots plus a few extra. 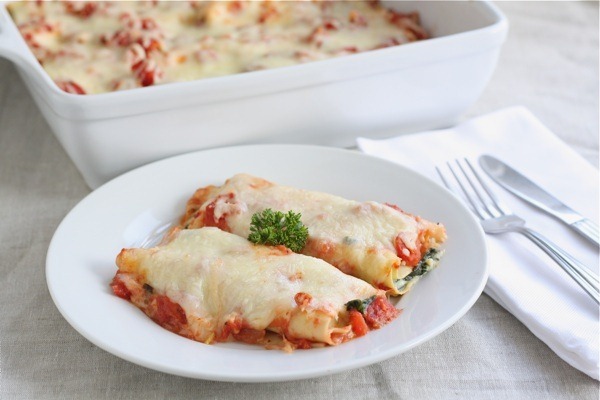 I am planning on making a spinach mushroom cannelloni and will post the recipe later on in the week. You might also like to make Chicken Parmesan Bundles, Lazy Baked Greek Chicken, or Mini Florentine Cups. For the lettuce, carrots, and tomatoes check out the BBQ chicken Salad recipe for a great spring time dinner salad. If your Barbecuing don’t forget to Barbecued Zucchini to go along with your meal or try Baked Zucchini instead of the deep fried option. I love to make either the Oven Roasted Asparagus or the Prosciutto Wrapped Asparagus with my asparagus. But the Balsamic Asparagus Chicken was a great main dish as well. 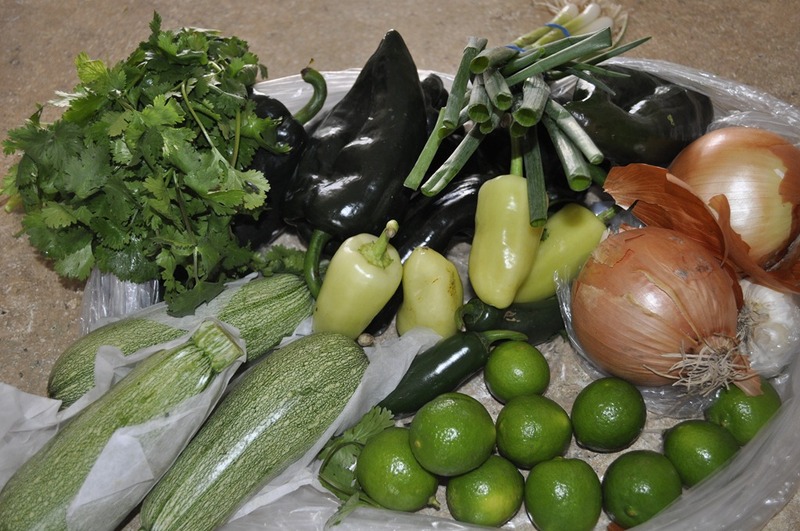 I also picked up a Mexican Pack this week and it had several different kinds of peppers, cilantro, Mexican squash, limes, onion, garlic, and green onions. I am planning on making a great chicken enchilada recipe that uses tomatillos, peppers, onion, and garlic. I will post that later in the week once I make it. 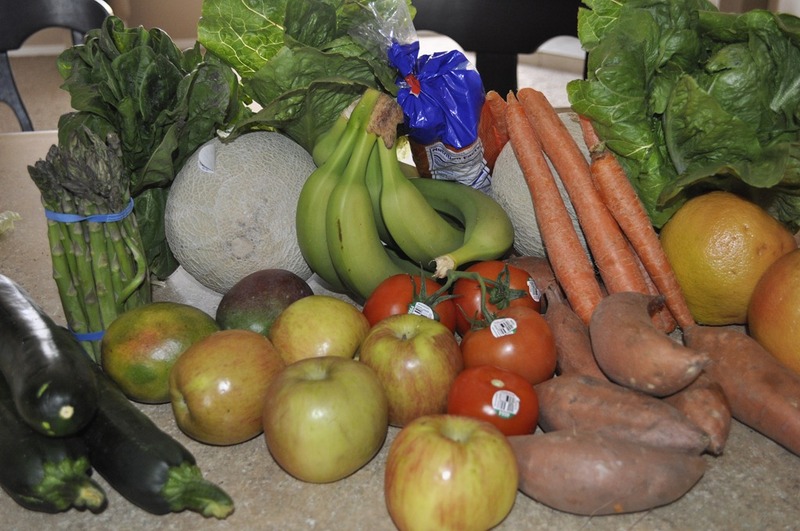 Enjoy your Bountiful Baskets this week! I have love garlic on almost anything. I think it adds a lot of flavor to any dish and usually when something calls for garlic I add an extra clove or two just to make sure you can taste the garlic. Now the good thing about this is that my husband also loves garlic so we can both have garlic breath together. Since I love garlic so much when I found this recipe I was game to try it. 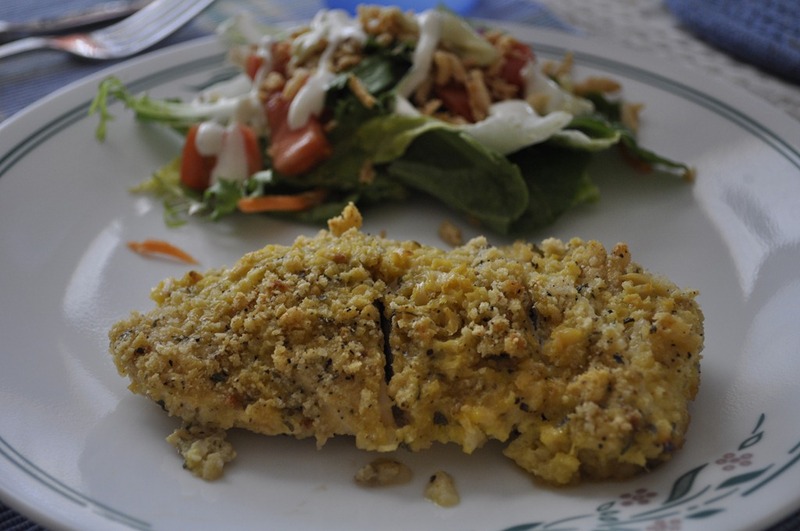 It uses 6 cloves of garlic and garlic powder so it has a huge garlic taste. It was a great chicken recipe that was fast to make once I remembered to thaw out the chicken breast so I could marinate them. I hope you will enjoy. You start off by taking 4 boneless, skinless chicken breasts and one by one place them under two pieces of plastic wrap. Then pound them down to about 1/4 inch in thickness. Mine we frozen from Wal-mart and were a very unusual shape so this was defiantly needed. Then place them in a Ziploc bag along with 3 egg yolks and 6 cloves of garlic. I have gotten so tired of chopping garlic that I have bough a big jar of garlic that has already been chopped. Once you have it all in the bag squeeze all the air out, seal the bag and coat the chicken. Then refrigerate for at least 4 hours or overnight if you have time. When you are ready to start cooking your meal mix together the Panko bread crumbs, Parmesan cheese, dried parsley, garlic powder, salt, and black pepper in a bowl. You could use regular bread crumbs but the Panko are a bit bigger and I think really added to the texture of the breading. Take the chicken, one by one, out of the bag and dip in the crumb mixture. 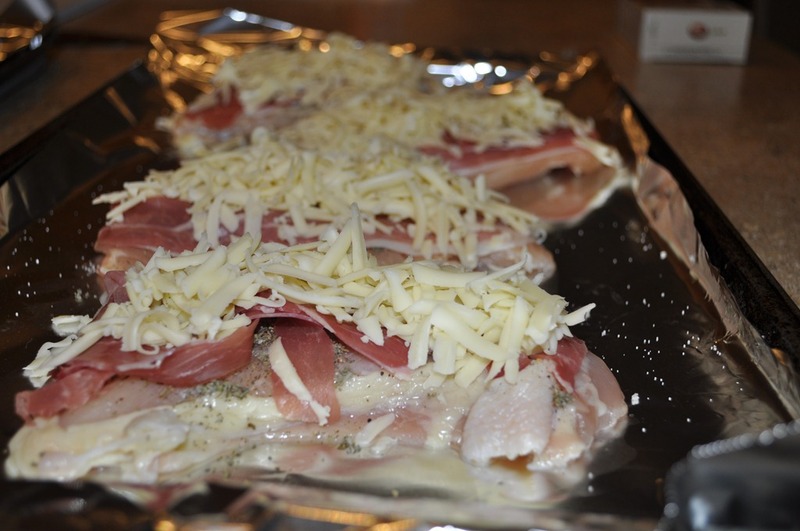 Then place the coated chicken in a baking dish in which you have melted 6 Tbsp. of butter into. Once all the chicken is in the dish pour the remaining egg mixture over the top. Bake at 400o F for 20 minutes or until the chicken is no longer pink. A simple and tasty chicken recipe! ~ 1 Tbsp. black pepper. 1. Take each chicken breast and place it in between two pieces of plastic wrap and pound them down to about 1/4 inch in thickness. In a small bowl beat egg yolks with garlic. 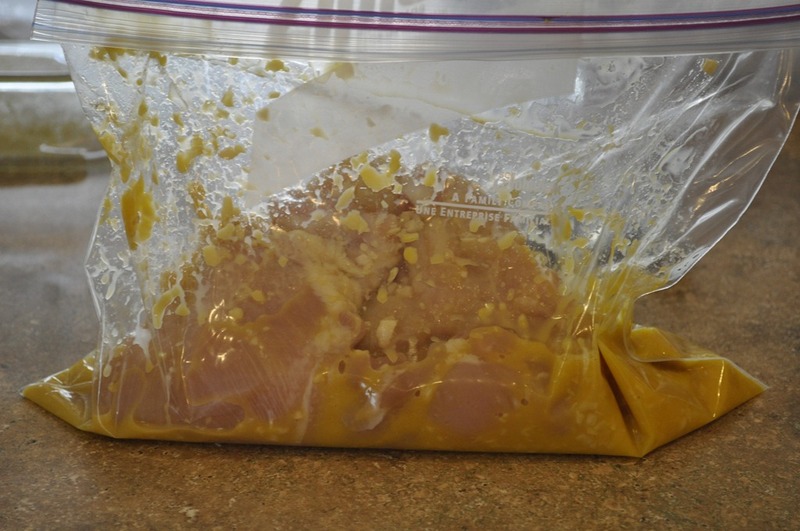 Place the chicken breasts and egg mixture in a large Ziploc bag. Squeeze all the air out and seal tightly. Refrigerate for at least 4 hours or overnight if possible. 2. Preheat the oven to 400o F. Melt butter and pour into the bottom of a 9 x 13 baking dish. 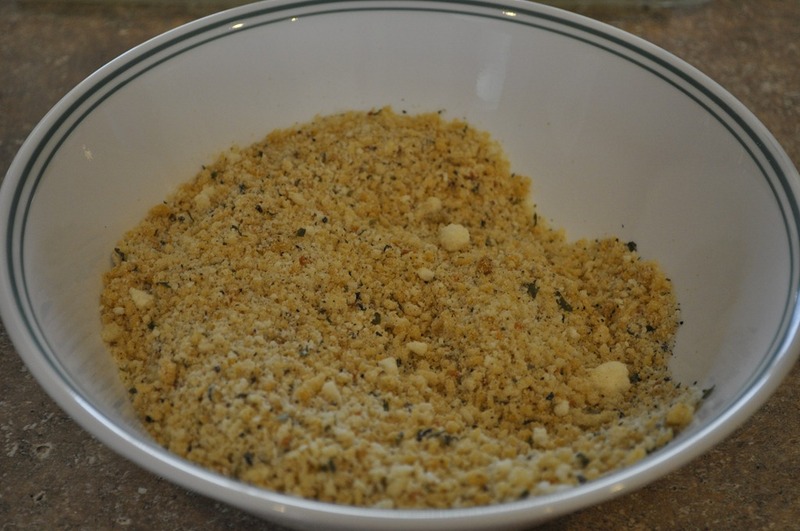 Mix together the bread crumbs, Parmesan cheese, parsley, garlic powder, salt and pepper. 3. 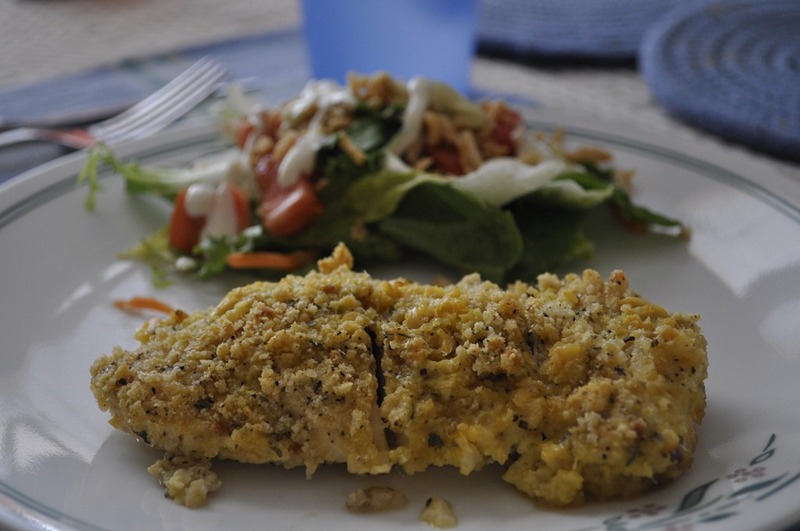 Dip marinated chicken in crumb mixture. 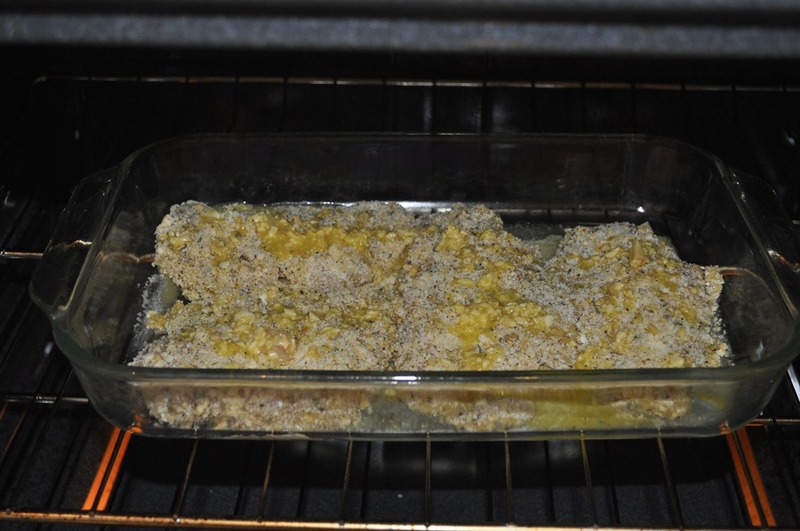 Place coated chicken in baking dish and pour remaining egg mixture over the top. 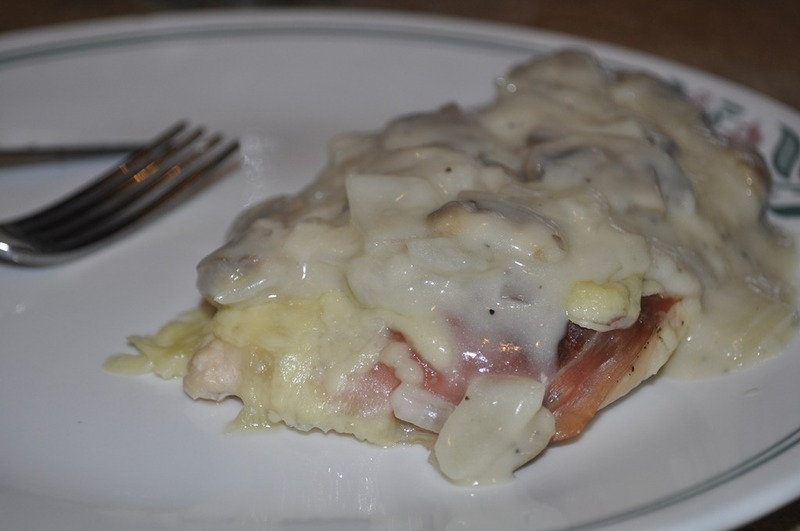 Bake for 20 minutes or until chicken is no longer pink.